Redditch based Brotherton Accountants return to Pedleyonline to re-design their website for a new contemporary style with widescreen layout and images. The new website, developed in WordPress has a responsive / mobile friendly framework, meaning it’s easy to view and navigate from mobile devices. 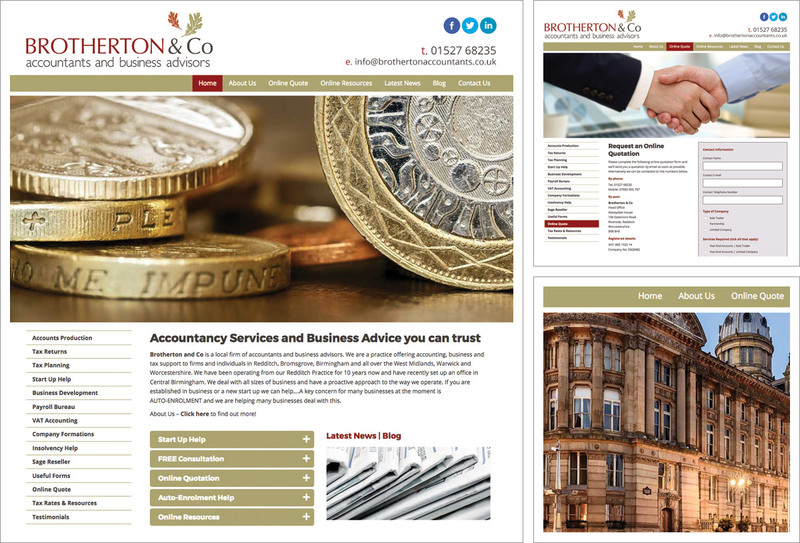 All of the valuable assets from it’s predecessor were retained and replicated on the new site, those being the Brotherton Accountancy branding and all of the website text content, resources and links. A horizontal navigation menu and lefthand contextual menu have been implemented to make organisation and accessibility of embedded content easier. Also complex text content and data has been more elegantly displayed by integrating table where appropriate. The new layout allows the content to breathe and makes it much more readable. Whilst most of the enquiry forms across out portfolio of websites are very simple, the Brotherton site required a more bespoke and complex online quotation form. Brotherton Accountants are active on social media platforms, Facebook, Twitter and Linkedin which can be linked to from their site. The new Brotherton Accountancy website is the ‘go to’ site for anyone looking for professional, informative, active and comprehensive information for their Midlands based business. We’re so impressed with their website that we decided to enlist their services ourselves. We have used Pedleyonline to completely redesign our website and bring it up to date. Brian exceeded our expectations on both design and technical knowledge to ensure all the SEO completed in the past was not lost. Brian redesigned everything to our brief and added in extra design features which we wouldn’t have been aware of to enhance the site further, beyond what we had envisaged. The end result being one we are extremely happy with. Brian goes the extra mile in making sure everything is how it should be and every step of the way, you know there is full commitment to what he is trying to achieve for you as a client. I have recommended Brian to many of our clients who have needed simple websites to full blown e-commerce sites and every one of them has come back to me with nothing but praise for what they have received. I would not hesitate recommending Brian and will continue to do so moving forward.